Gomaco Trolley Company had the opportunity to build its first replica Birney trolley in 1999, with the finished product being transported to its new home in Tampa, Florida, in February 2000. 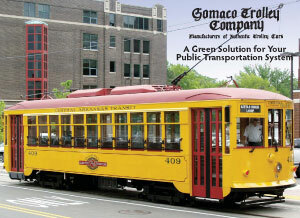 Since then Gomaco Trolley Company has completed eight more replica Birney trolleys for HARTLine of Tampa, five for the Central Arkansas Transit Authority in Little Rock, Arkansas, three for the Charlotte Area Transit System in Charlotte, North Carolina, and one for the Memphis Avenue Transit Authority in Memphis, Tennessee. Select any of the photos below to learn more about the different replica Birney trolleys in operation.